We educated our legislators. We wrote letters and made phone calls. 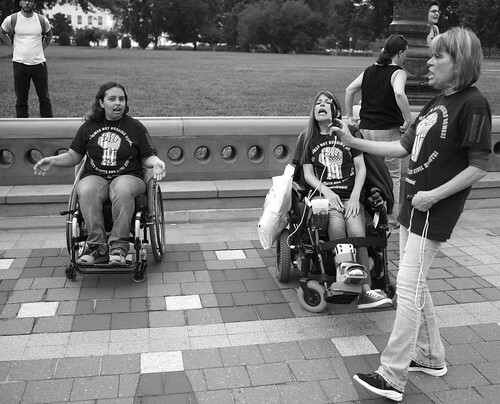 We worked hard to get the message across, yet the House judiciary committee has chosen to take the next step to dismantle the Americans With Disabilities Act (ADA): H.R. 620 will go in front of the entire House of Representatives for a vote. We have no idea yet when that vote will be, so we need to renew our efforts to educate and persuade our lawmakers, so they will act to protect the ADA, and reject H.R. 620 and its agenda to confuse and limit the ADA. Whether you use the script or tell Representatives in your own words, it is crucial that we all make our voices heard now, as quickly and as emphatically as possible. Disabled rights are human rights, and that means that everyone’s rights are in danger right now. We cannot let this attempt to roll back human rights legislation go unchecked. It’s time to pick up your phone, your TTY, your keyboard, or whatever communication device will allow you to make your opinion known to your Representatives. If you don’t know whose jurisdiction you live in, check Contacting Congress, a web directory of Senators and Representatives in the U.S. federal government. If you can’t get your voice heard through the usual channels, ask your friends, family, support staff, or disability rights organization to help you get the message through. So many of us depend on a solid ADA to protect our education, our participation in the community, and our beautiful and valuable lives. The time to act is now! We must protect the ADA and the rights of disabled people in the United States. Tell your Representatives that a vote against H.R. 620 is a vote for the lives of scores of millions of disabled Americans.